My Summer Cottage in Babylon: Like Top Gun, but in space. So, Will and I went on a last minute date last night to see Star Trek. I totally have the hots for Spock. Now there's a sentence I never thought I'd utter. The movie was great. I highly recommend it, even if you've never been a Trek fan. Personally, I never really liked the original Trek series (or the movies). I was very much into The Next Generation, though. (I totally had the hots for Wesley Crusher). (Yet another sentence I never thought I'd utter). 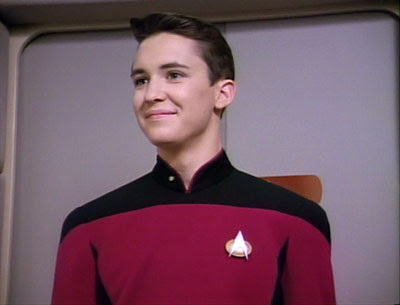 Ensign Wesley Crusher: My first intergalactic geek love. But, this movie made me a convert. It kept just enough of the original series' cheesiness to allow you to believe that these are the same characters, but it was very well done. There wasn't a dull moment--not one. The two hours flew by. It was funny, it was sad, it was action packed without being over the top. It was everything a summer movie ought to be. And if you're a thirty something female who obsessively watched Top Gun when you were a teen (and before Tom Cruise became a nut job), then all the parts that take place on Earth will ring familiar with you. I was totally expecting Kirk to break out into a rendition of "You've Lost That Lovin' Feeling" to Uhura. Anyway, go see it. It's worth the price of admission.